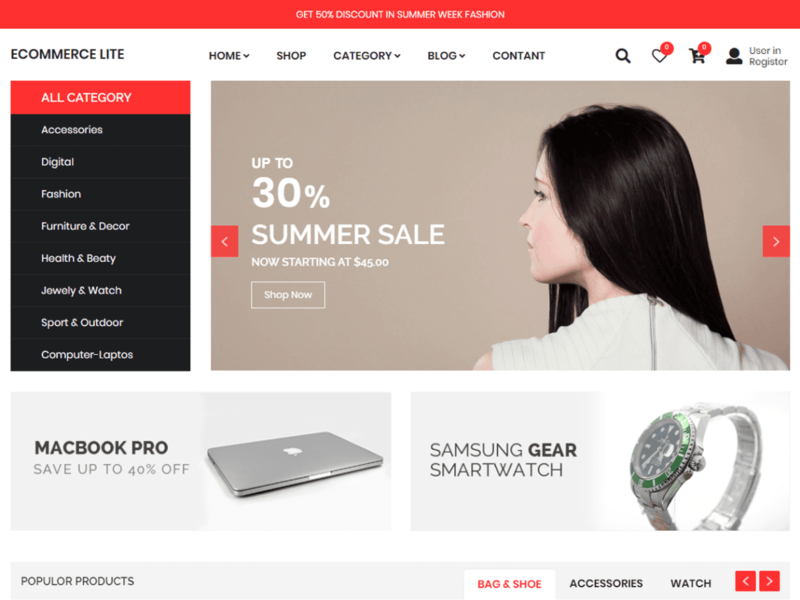 eCommerce Lite is a modern free WooCommerce WordPress theme especially designed for shops and eCommerce sites. It could be used for all types of ecommerce online stores, including: Fashion, Shoes, Jewelry, Watch, Sport, Technology, Mobile… eCommerce Lite is easy to use and fully responsive. It comes with an eye-catching layout design that will instantly draw the attention of anyone who visits your website. Theme is translation ready. eCommerce Lite is SEO friendly helping you to achieve the highest positions on Google and optimized codebase to maximize your site’s performance and loading speed. The Theme Customizer is truly magic tool to customize theme with pre-defined parameters, no coding is required. Main theme features: primary menu positions, search,top banner for promo , shop by category, right sidebars, custom logo, custom background, breadcrumbs, fast loading, cross-browser compatibility, font awesome, documentation , support, bootstrap grid layout. Theme including support for wishlist, quick view and compare plugins.